Cutting boards are rather underrated kitchen tools, but having the right one not only helps make food prep safe and easy, it can also prolong the life of your precious kitchen knives, not to mention countertop. Investing in at least two cutting boards is a good decision. You’ll need one for raw meat and one for everything else. If you’re especially sensitive to odors like onion and garlic, you may want to keep a small cutting board for more pungent ingredients. We are fans of the Teakhaus Rectangle Cutting Board. It’s heavy and sturdy enough to stand up to tough chopping tasks but light enough to be maneuverable. You won’t have to be too fussy with maintenance and it’s a great kitchen basic that looks good but won’t break the bank. In this guide, we will look at some of the best cutting board options to buy this year in our cutting board reviews and comparisons. This wood cutting board looks beautiful on a countertop. It’s solid and easy to move with the slim hand grip on the side. While the Teakhaus cutting board is pretty big (24 x 18 x 1.5 inches), it’s thinner and lighter than some of our other picks. 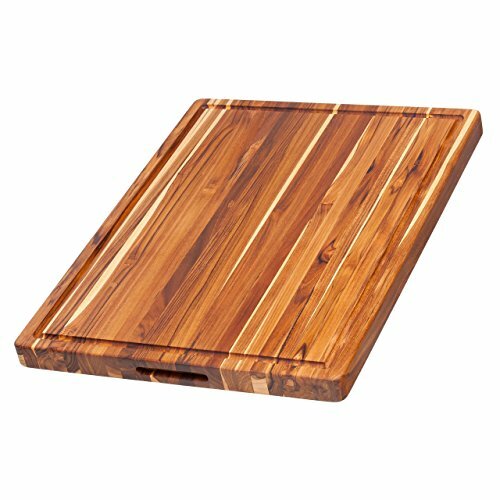 The sustainable teak wood used in this board is sturdy enough to withstand rough chopping of ribs and other tough foods. Teakhaus is confident in the longevity of these boards and offers a 12-month warranty on this product. While there are some concerns with wood harboring bacteria, the current USDA and FSIS guidelines suggest that using a wooden board with meat and poultry is fine, as long as you use a separate one for vegetables and clean your meat board properly. Teak is pretty oily, so maintaining this cutting board is extremely simple. All you need to do is rub it down with mineral oil occasionally when it starts to dry out. A single bottle of mineral oil should last you several years. The Teakhaus cutting board is one of the two large wooden cutting boards we recommend. If you’re content with a 14-pound, 1.5-inch thick board, this Teakhaus may be a great option. If you’d like a thicker, heavier board, check out the John Boos cutting board. In addition to the difference in thickness, the Teakhaus requires slightly less oil. Otherwise, things are pretty similar. 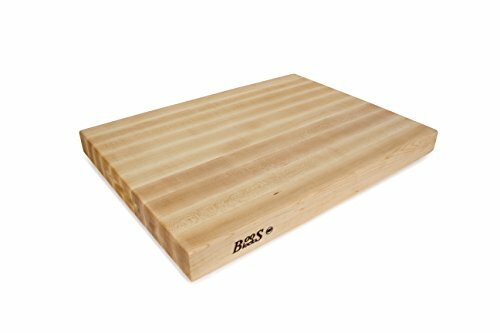 This John Boos reversible cutting board is a big, thick cutting board. You’ll have no problems dismantling big cuts of meat or chopping lots of tough vegetables on this 24 x 18 x 2.25 inch maple board. It’s heavier than the other boards we recommend, weighing in at 27.5 pounds. If you want a beautiful, robust surface for heavy-duty kitchen work, it’s a serious choice. John Boos boards have a smooth, even cutting surface. While you’re not supposed to immerse the board in water, you’re free to gently wash it with soapy water or a disinfecting solution. Maple isn’t a super wet wood, so it’s best to oil this board about once a month. You can use any food-grade mineral oil you have around the house. There are two indentations on either side of the board to help you move it around. Given the weight, they’re pretty necessary, although you’re probably going to just wrap your fingers around the side as soon as you get the board off the counter. The sheer size of this cutting board means it’s not going to fit in the sink, so it’s a slight hassle to clean. Still, there’s plenty of real estate to work with, so you can cut peppers on one end and potatoes on the other while still having a clean surface in the middle to chop an onion. 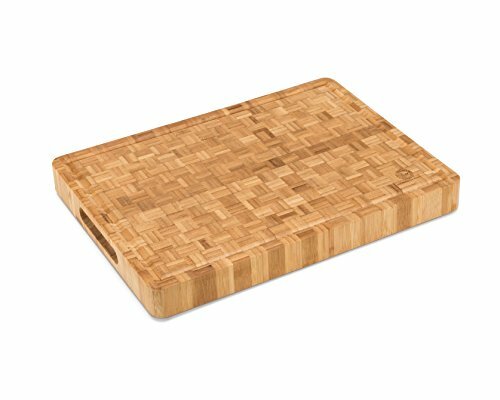 The Top Notch Kitchenware bamboo cutting board sports a unique checkerboard pattern that sets it apart from our other choices. This cutting board is a great fit in most kitchens due to its convenient features. It’s thoughtfully designed with non-slip rubber feet, a juice groove, and deep hand-holds on both sides. Bamboo has some mild anti-bacterial properties on its own. This makes it an ideal material to handle food on since it’s less likely to support bacterial growth. You’ll still need to wash, disinfect, and occasionally oil this board, but you can rest easier knowing your cutting board wards off bacteria. While we don’t have any hard data to back this up, we’re not sure that bamboo cutting boards last as long as wooden ones. Even if we disregard cracks and splits, bamboo will eventually turn fuzzy after a few years of use. Top Notch doesn’t offer any sort of warranty at all on these boards. We still think they’re great, but you should purchase this with the intention to replace it when it starts to wear out. The Architec Sheesham cutting board is available in a variety of sizes, from 10 x 15 inches to 12 x 16 inches. It’s made of responsibly-sourced rosewood from India and features striking grain patterns on both sides. Architec attaches large gripper feet to one side of their boards, ensuring you’ll get an even surface to cut on that won’t move around on your countertop. The flip side is that you can’t really use the back of the board. The feet are quite large, making them unusually hard to ignore. Architec says that no two boards are the same, so we can’t be sure what yours will look like, but many of the boards from this line feature striking grain patterns and seem to be made out of a single piece of wood. This makes a powerful aesthetic statement. You’ll scratch the board a bit as you use it, naturally, but the vivid lines and swirls will stay forever. Like other wooden boards, this rosewood board requires occasional applications of mineral oil to stay in good condition. We think that the OXO Good Grips cutting board (or one like it) is necessary for any kitchen, regardless of whether or not you’re planning on getting one of the wooden boards above. It’s available in a wide range of sizes, fully reversible (so you can use both sides), non-porous and easy to clean. While the FDIC has given us the nod to cut meat and poultry on a wooden cutting board, it’s still quite clear that you should have more than one cutting surface to avoid cross-contamination. This board fills your need for multiple cutting surfaces on its own. It’s reversible, so you can cut on the front or back, and it’s extremely light so you won’t mind flipping it. It’s also easy to store (since it’s light and thin) and much easier to disinfect completely than a wood or bamboo surface. Not only is it solid and non-porous, you can also immerse it in hot water or even throw it in the dishwasher. The grippy edges and juice groove that runs around each side are great features that help elevate this board over similar products. The sides do an especially good job of providing traction on your counter while doubling as handholds. 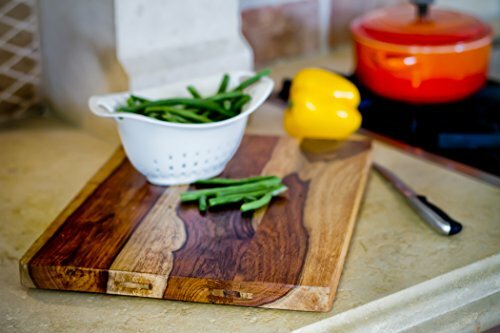 Choosing the right chopping board isn’t rocket science, but it will have some impact on your time spent in the kitchen. You need something sturdy that stays put, is easy to clean and can handle whatever chopping tasks you throw at it. Our top pick, the Teakhaus Rectangle Cutting Board fills all these criteria and is subtly attractive; it should fit into any style of kitchen décor. You also have the added assurance of a 12-month warranty. 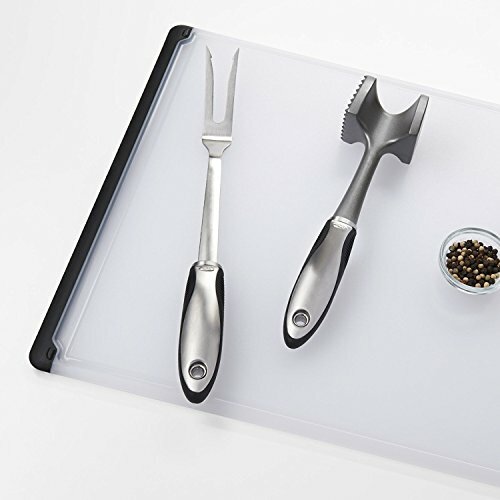 We do, however, recommend a second chopping board to keep meat prep separate from other food types, and suggest grabbing yourself the OXO Good Grips Cutting and Carving Board as a budget-friendly yet effective second option.